I tried this recipe in Ramazan. You might find different versions of this recipe on internet but this one is my own invention. 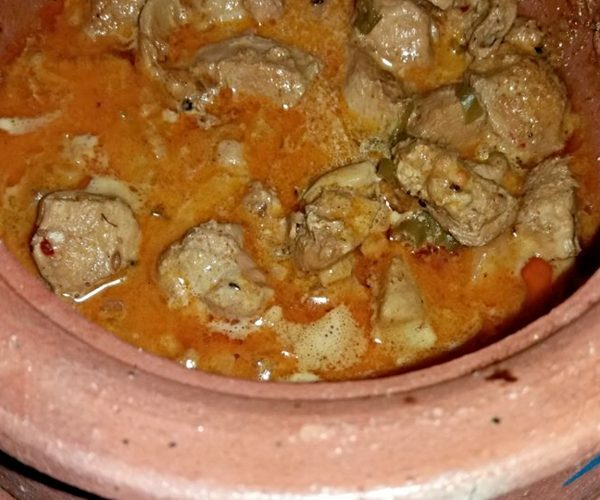 Its a combination of our typical Pakistani Handi recipe with a creamy touch. But still its not like that creamy white handi. Secondly I have made this in Desi ghee instead of oil so its good for those who are on keto diet as well as for those who are looking for healthy recipe options. Though most of you do not consider heavy “cream” as healthy option. but this recipe serves 4 to 5 persons and in my view if you are on a balanced diet plus some workout, 1/2 cup cream wont make a big difference. But still its optional if you want to add cream or not. Again I would say that it’s good for those who are on Keto diet. Add onions in the pan and cook till transparent. Put all the spices: salt, red chilli powder, red chilli flakes, cumin, coriander powder and kalonji and cook for few seconds. Add boneless chicken and cook for 2 to 3 mins, at this stage add another tblsp of ghee. Cover with lid and turn the flame to very low. Leave for 1/2 hour to 45 mins or till the chicken is tender. Turn the flame on and cook the handi for 30 seconds to 1 minute at medium heat. Your creamy chiken boneless handi is ready to eat. Serving Ideas for those who are not on diet you can have it with Chapati, Rice, Brown rice, Naan, Regular bread.